My college peers always ask whether I cook at home. As my Husband and I are among the very few married couples in college who live off campus, they are curious as how I balance my work, studies and family. I’ve decided to share my secret because I think this is very convenient for students who live on campus as well because you don’t need to install anything. You just need a plug (and all the ingredients) and you’re all set! There are 6 products under KHIND Signature Series: Noodle Cooker, Coffee Maker, Jug Kettle, Bread Toaster, Stir Fryer and Hand Blender. This premium collection is designed to combine both contemporary and luxurious exterior, just perfect for any kitchen! This series is all about stainless steel. The collection has a premium outlook, and yet they are affordable for every household. My personal 'Assistant Chef' is the KHIND Signature Series - Stir Fryer! This is because the Stir Fryer is a fully automatic cooker. It can stir fry, pan fry, saute, braise and toast. The Stir Fryer leaves no mess in the kitchen as the oil fume is collected by the Stir Fryer itself. It has a timer so you can set the length of time you need for it to run and when you need it to stop. It is easy to clean and even easier to use! 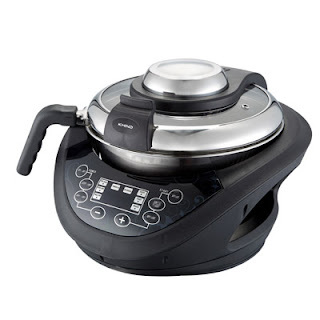 The Stir Fryer is also great for healthy cooking as it doesn’t need a lot of oil. So what do you have to do? You just have to put in the ingredients, choose a settings and set the time and TA-DA! It’s all done! And yes, you can do everything else while it cooks; work, clean or even take a nap without worrying about burning the food or even burning down your kitchen! Just this afternoon, I used the Stir Fryer cooking iftar for my friends who came over. I made Chicken Rice with Stir Fried Vegetables. This recipe is one I learnt from my best friend and #teambridesmaid, Maisyarah Mazlan. Mai is also a student who lives with her college-mates. This is a very easy and convenient recipe that is suitable for everyone to make! I always have fun with my Husband when cooking with the Stir Fryer because we are such noobs at cooking! We love the Stir Fryer because it’s convenient, easy to use and safe! All products under the KHIND Signature Series comes with a 2-Year Warranty. There is nothing wrong with wanting.